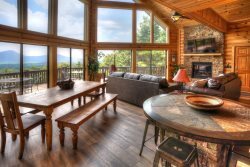 Five Seasons - Gorgeous Mountain Cabin Rental near Helen, Georgia. Incredible Panoramic Views. Spacious Decks, Outdoor Firepit. Almost Heaven is a rustic, upscale mountain cabin offering an incredible birdseye perspective of the deep layered mountain views from this tranquil Mt Yonah setting. You'll feel far enough away to take in the quiet and peaceful mountain setting, but the nearby village of Helen is just 5 miles away. Almost Heaven is also close to several of our wonderful local wineries -- 3 miles to Serenity Cellars, 6 miles to Yonah Mountain Vineyards, and 8 miles to CeNita Vineyards! 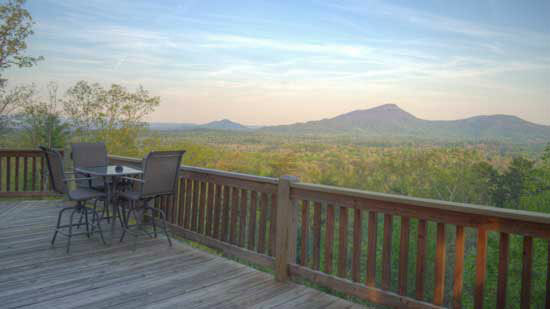 The location is ideal for those wanting a little bit of everything, all wrapped up in one beautiful cabin! The open floor plan and floor to ceiling windows is a great choice for a medium size family up to 6. It's also a wonderful choice for couples looking for a great setting to enjoy each other's company! Relax on the huge deck with plenty of Adirondack chairs, cook out on the grill, or enjoy a frosty beverage and amazing views from the covered hot tub. It's an experience you don't want to miss -- rain or shine! The hot tub and view was the best. The home was beautiful and we truly enjoyed our stay. Such a gorgeous home with an unbeatable view. Can't wait to come back!